I bought this thermometer because my daughter suffers from ear infections and doesn't like the in ear ones. It was quite expensive but it is brilliant. You can check the temperature of food and surfaces as well as body temperature. 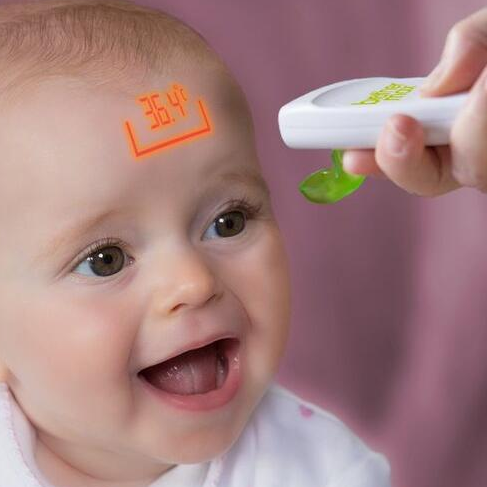 Its really easy to use you just point it at babies head and press the smiley and it reads a clear temperature. You do need to read the instructions as you have to be the correct distance and you need to remember to calibrate it. I have found this to be very accurate and i can use it when baby is sleeping. I have actually bought two of these as my children love to randomly check the temperatures of things and my first one got dropped in the bath. I do recommend hiding it! Obviously this is am amazing product! I mean I can check even room temp and water temp with it! It is like using a laser pen. It reads quickly without even needing to touch whatever I am checking. It is a Fab thermometer but complete unnecessary! It is totally.not needed and such cheaper one does the trick! But if you want a great gadget.....go grab one! Very expensive option. Readings can be inaccurate outside. This is one of the most expensive thermometers on the market. The best thing about it is that it doesn't need to touch your baby so you can take their temperature while they sleep without disturbing them. I find the readings accurate when at home but out and about the external air temperature affects the reading. The option to check room and water temperature is a useful feature but sometimes it can be difficult to see the projection depending on what colour it's on. I have replaced the batteries once in 5 months. Although it is not the smallest thermometer it is still compact enough to carry around in the nappy bag. 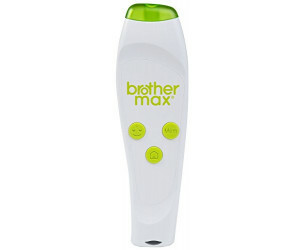 The Brother Max 6-in-1 Projection thermometer is non-contact, quiet and easy, making it ideal for the whole family. It can be used to measure your child’s temperature at first sight without contact as it projects the temperature reading from the thermometer onto their forehead. The illuminated projection feature makes taking an accurate reading simple, with its unique built in ‘aiming’ system. Just ensure the projection targets the desired reading surface, centered in the outer cradle. This will endure the correct distance is reached to deliver the most accurate and reliable reading. The 6-in-1 Projection thermometer can also be used to measure bath water, liquid, ambient temperature, food or skin (body) temperature, with a range from 1-80°C. The memory function also records the last nine readings. To calibrate the thermometer (MUST be done prior to use): Point the thermometer towards an internal wall surface. Press the FACE and HOME button simultaneously. Once the word CAL is in-between the guide-marker, release the buttons. Instructions on how to use the product: Press the FACE button to take a forehead temperature reading. Press the HOME button to take bath water, liquid, room, food or skin temperature readings. Press the MEM button to access the memory function and read up to nine previous temperature readings.